Help Students Find Their Ideal Career with our 4-Day Career Assess & Learn (CAL) Program! Bruce Bloom, M.Ed. 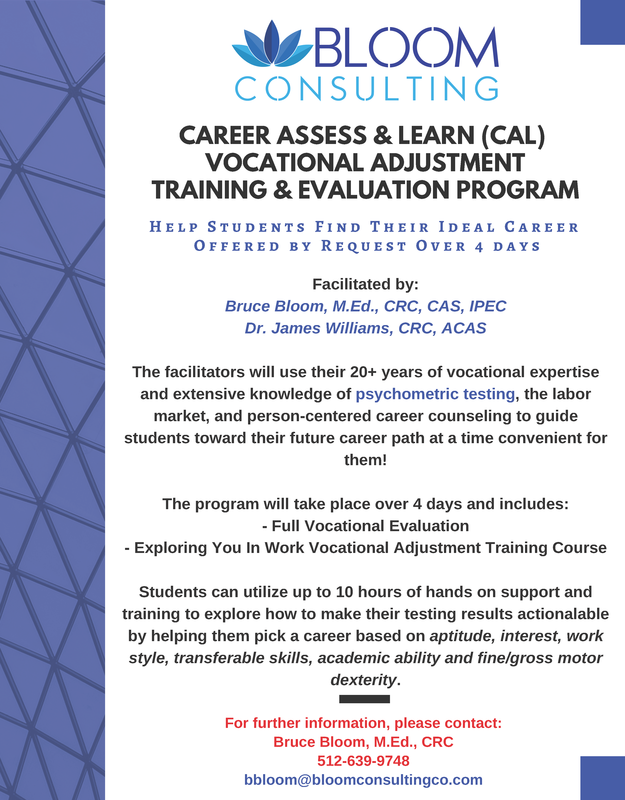 and Dr. James Williams, both Certified Rehabilitation Counselors and Vocational Experts, will utilize their extensive knowledge of psychometric testing, the local labor market, and over 2 decades of career counseling to help your students find their future career path at a time convenient for them! The program will take place over 4 days and includes a full TWC Vocational Evaluation and the “Exploring You In Work” Vocational Adjustment Training (VAT) course where students can utilize up to 10 hours of hands on support and training to explore how to make their testing results actionalable by helping them pick a career based on aptitude, interest, work style, transferable skills, academic ability, and fine/gross motor dexterity. Must be willing and able to test independently and attend to group instruction, with minimal disruption to the group, for short periods of time over 4 days, without the use of a dedicated paraprofessional or aide. While basic instructional, physical, or testing related accommodations will be made, this is a group service which means that extensive and/or constant 1 on 1 assistance/supervision is not possible.